In September/October 2018 Physiopedia and the International Committee of the Red Cross (ICRC) successfully delivered the Wheelchair Service Provision Massive Open Online Courses (Wheelchair MOOC) via the Physioplus online learning platform. This programme of four courses and optional written assignment were based on the “Guidelines on the provision of manual wheelchairs in less-resourced settings” developed by the World Health Organisation (WHO). In collaboration with Humanity & Inclusion (HI) a French version of the programme of courses was delivered concurrently. 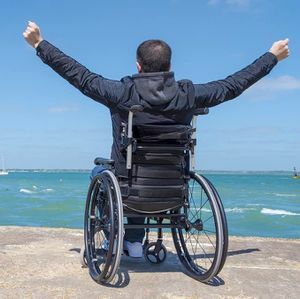 About this course - This online programme of four courses provides a comprehensive theoretical understanding of Wheelchair Service Provision including the theoretical principles, skills and knowledge underlying the management skills and knowledge in the management of wheelchair service delivery. There was an English and a parallel French version of the programme of courses. Who were the courses aimed at - These courses were written for physiotherapy clinicians, students and assistants; other healthcare professionals interested in this subject were welcomed to participate. Requirements – Participants were required to complete online learning activities, engage with additional resources, take part in the conversation online and complete the course evaluation. Assessment - There was a final quiz and participants could optionally complete an assignment to demonstrate their learning. The Wheelchair Service Provision MOOC was developed as a collaboration between Physiopedia and ICRC. Physiopedia and ICRC provided funding. The “Guidelines on the provision of manual wheelchairs in less-resourced settings” developed by the World Health Organisation were used as the basis for these courses. HI completed the French translation of the programme of courses. Special thanks to Naomi O’Reily for managing the content and course development. During September and October 2018 Physiopedia ran their seventh Massive Open Online Course titled Wheelchair Service Provision (Wheelchair MOOC). This was delivered as a programme of four courses and an optional written final assignment. These courses were developed as a collaboration between Physiopedia and ICRC. The course structure and content was based on the “Guidelines on the provision of manual wheelchairs in less-resourced settings” developed by the World Health Organisation (WHO) which was supplemented with additional material from global experts. A French version of the programme of courses, translated and facilitated by HI, ran concurrently. The aim of the Wheelchair MOOC was to train the distributed team of ICRC staff and partners to have a basic understanding of the theoretical knowledge that underpins the provision of wheelchairs to appropriate clients in a variety of contexts. The content of the courses was designed for physiotherapists in any global context, all healthcare workers from any location and context were invited to participate. Being open for anyone to participate allowed for global conversation around the topic and enabled peer-to-peer learning across contexts and experiences. The four week long courses presented different topics through a variety of learning activities to suit all learning styles. The required learning activities within each course were developed to take between 4-6 hours depending on the participant's learning style and optional activities were provided should the participant wish to take part in additional learning. A short orientation period before the course started provided participants with an opportunity to become familiar with the delivery platform and the topic via the provided pre-course resources. The course was delivered through the Physioplus (P+) online learning platform, an innovative platform specifically developed to deliver online education and provide learners with a personalised learning dashboard. For each course the related learning activities were released on a specific course page. As participants engaged with each course learning activity it was recorded and displayed in their own personal learning dashboard. To finish each of the four courses, participants were required to complete all the required learning activities and pass a final quiz that tested knowledge. Finally there was an optional course which included a written assignment to demonstrate their learning from all four courses. On completion of each course the participants could download a completion certificate and also export a record of their learning from their activity log. This report evaluates the experiences and engagement of the participants on the Wheelchair MOOC. The programme of four courses aimed to provide a comprehensive theoretical understanding of Wheelchair Service Delivery and to develop an understanding of the theoretical principles, skills and knowledge underlying the management skills and knowledge in the management of wheelchair service delivery. This course was suitable for all healthcare professionals but specifically aimed at physiotherapy professionals including clinicians, assistant or students who have a good understanding of the key principles of physiotherapy but little prior experience in wheelchair provision. It was also of interest to any professionals (e.g. prosthetists, orthotists, nurses, occupational therapists, speech therapists, medical doctors) motivated to upgrade their knowledge on wheelchair provision. The course was free to all participants who completed the course within 8 weeks from the start date and remains free to all residents of low income countries on a permanent basis. The programme of courses started on the 1 September 2018 when the first course contents were made available. A new course was released each following Monday for another 3 weeks. Participants had until 31 October 2018 to complete the courses under their free access to Physioplus. The course remains available on the Physioplus platform to members; membership is free to individuals from low income countries and available at a discounted rate to individuals in middle income countries. Course completion certificates were provided by Physiopedia to all participants that passed each course within the programme. The programme of courses was accredited by the Australian Physiotherapy Council, the South African Society of Physiotherapy (total 22 CEUs) and The Federation of State Board of Physical Therapy (total 16 CEUs). 5,559 participants formally registered for the programme of courses before the end date of 31 October 2018 (5296 English registration and 263 French registration). They represented 148 countries, the most represented countries are detailed below. For full results see Appendix 1. The four courses were delivered on Physioplus. The related course pages were visited a total of 39,340 times before the final date of the supported course on 31 October 2018. The four courses involved a total of 91 required learning activities (full details in Appendix 2). Participants were required to participate in the discussion forum on a weekly basis. They were required to take part in a minimum of 10 discussions over the programme of courses with making between 2 and 3 posts per course. This was made a requirement as it provided a rich learning experience through self-reflection on learning and exposure to global discussions about clubfoot. This was the task that participants found most difficult to complete. The discussion forum was hosted on the Physioplus platform where participants were asked to comment on the weekly guided discussions. It was clear that not all people engaging with the course joined participated in the discussions. In each course participants were given the opportunity to assess their knowledge and understanding of the topic through a multiple-choice quiz. Participants received immediate feedback on right and wrong responses making this a rich learning experience. The pass mark was 80% and they could attempt the quiz as many times as they liked. To complete each course participants were required to fully engage with all the related required learning activities (Appendix 2), participate in the discussion forums and pass the course quiz. From Physioplus, they received P+ points (equivalent to hours of learning) for every learning activity that they completed and a course completion certificate on completion of all the required elements of each course. Reflecting on their learning and using the knowledge gained throughout the courses participants could submit an optional assignment. Participants were asked to follow the assignment guidelines on Physiopedia and the assignments were assessed by the Physiopedia team. The marking rubric was kept fairly simple but each assignment needed to demonstrate: evidence of learning from the course, academic skill with evidence based writing and proper referencing and written English skills. 529 (507 English and 22 french) participants completed the evaluation forms at the end of each of the programme courses. Overall there was agreement that the courses were enjoyable to work through, an appropriate length with the right amount of work required each week, was pitched at the right level and would be recommended to colleagues. The participants stated that they found the Physiopedia pages, videos and quizzes most useful for learning. Broadly all the activity types were found useful with no activity type reported as not useful for learning. In qualitative feedback that asked “what were the best elements of the course”, participants almost universally responded positively about the course. It was clear that each and every type of resource and activity was identified by a significant proportion as being the best element with no clear pattern emerging. Some individuals identified the wide variety of resources and activities as their best element of the course. Illustrative sample comments can be read in Appendix 3. When asked “how could this course be improved” the most common opinion was that the course was excellent and did not need improvement. Of the issues raised the most common was the number and duration of reading activities and the limited nature of the discussion in the forum. Common suggestions were to increase the use of images and videos and to offer the course in more languages. Illustrative sample comments can be read in Appendix 4. This feedback demonstrates the many different learning styles and preferences that course participants have. For this programme of courses, some people prefer the reading activities, others the videos, while for a handful the discussion forum activities were the highlight. In the evaluation form participants were asked “describe any way in which this course has changed your clinical practice”. Many participants had no prior experience of working with wheelchair users and these individuals reported increased confidence if they did encounter such a clinical situation in the future. Many expressed a greater awareness of the variety of types of wheelchair available and their suitability in different circumstances, the biomechanical issues to be considered in fitting and the physical conditions that can be experienced by wheelchair users. Overall most participants expressed the opinion that they felt able to provide a better quality of service to this client group following the course. Illustrative sample comments can be read in Appendix 5. The wheelchair is a commonly used assistive device which provides an opportunity for its users to dramatically increase their quality of life. This course provided an accessible introduction for interested individuals to gain theoretical knowledge of the process of providing wheelchairs to appropriate clients and learn with an international network of colleagues. Continued free access to the course content via the Physiopedia website allows health care professionals and carers to gain access to knowledge at any time in an easily accessible way. The course registration data demonstrated the unique opportunity that this course has provided in offering an easily accessible knowledge development option for health care professionals across a wide distribution of geographical locations and contexts. Course evaluation data indicates that the variety of resources and activities is an important characteristic of the courses that is required to meet the wide range of learning styles and preferences. Highlighted areas for improvement should involve adding further visual elements, reducing the length of long reading materials, avoid repetition of content and also aim to increase conversation within the discussion forum. Participants in low resource settings sometimes requested to access an offline version of the course to avoid problems caused by poor Internet connection. The evaluation also provides strong evidence that improvements in clinical practice will result from participation in the courses. This will include more appropriate wheelchairs being prescribed, improved biomechanics in the fitting of the wheelchair, and increased focus on providing the user with training in the long-term use and maintenance of their device. I enjoyed reading the articles and reading the replies from the group discussion. The videos and the comprehensive text of the topic makes the course more understandable and deeply knowledgeable. Virtually, I found all parts very useful and informative. The best elements of the course: the dynamics, the exchange in the forum, the videos and the texts to read. The best elements of the course was the experiences shared by wheelchair users, references through journals. It was a good combination of different aspects - reading, tasks and videos. The physiopedia pages are very interesting and have a lot of important information. I enjoyed the detail that was including regarding the different features of the wheelchairs that are available along with a review of how to take appropriate measurements. Having different modules from article, journal, videos, etc. Both basic and intermediate level contents in ready format helps well. The variety of activities, it wasn't just a single form of education delivery. The videos were the best elements of the course. The discussion forum feels a bit forced and not useful. There is a lot of reading - probably too much. This course could be improved more if it's translated in many more languages. There is a lot of read work! Already well structured and varied! I think if the course was more visual (more pictures, videos, presentations) it would be easier to understand, especially the mechanical issues of the wheelchair. Every aspect of this course is good. But it's quite tricky/ hard for me to navigate from one topic to another and sometimes it's quite confusing. But overall I do love the information provided in this course. It can be improved by reducing the volume of the articles to be read, yet maintaining the content. There were some spelling errors, but these were not a hindrance to learning. Some information was repetitive in the readings. Parts of the course felt rather long and time consuming. I would have appreciate an estimate time of completion for each section so I can plan my spare time around it rather than staying up late at night in order to finish it. I have a broader perspective about the purpose and design of wheelchairs used around the world. I will be more conscientious of evaluating my patient's environment when selecting an appropriate chair. The impacts of biomechanics and seating on propulsion will impact how to evaluate children for wheelchairs. I will consider an extended-castor 3 wheel option for folks that live out in more rural communities. For patients with Spina Bifida, for the wheelchair prescription, I will have to look into account the Shoulder overuse syndrome. I got to understand that not everyone can use the same wheelchair. it is important to access the conditions first. I will be able to be more knowledgeable when completing my wheelchair assessments, even working with ATPs, and will be more thorough in completing measurements to provide the best fit w/c. I think more, how can I make wheelchair more suitable for patient. Even one change of the biomechanics make a huge difference. I would try to keep everything in my mind whatever i have learned here before i prescribe a wheelchair to my patient. I now have a grounded knowledge on wheelchair and wheelchair users. In my 2 years of practice in Nigeria I've had very very little knowledge of the topic. Now I'm going to create an awareness in whatever way I can. I will probably take into the biomechanics and the design of the chair a lot more. Although you listen to your patients, you can always learn from them so paying bit more attention to activities etc may always help too!